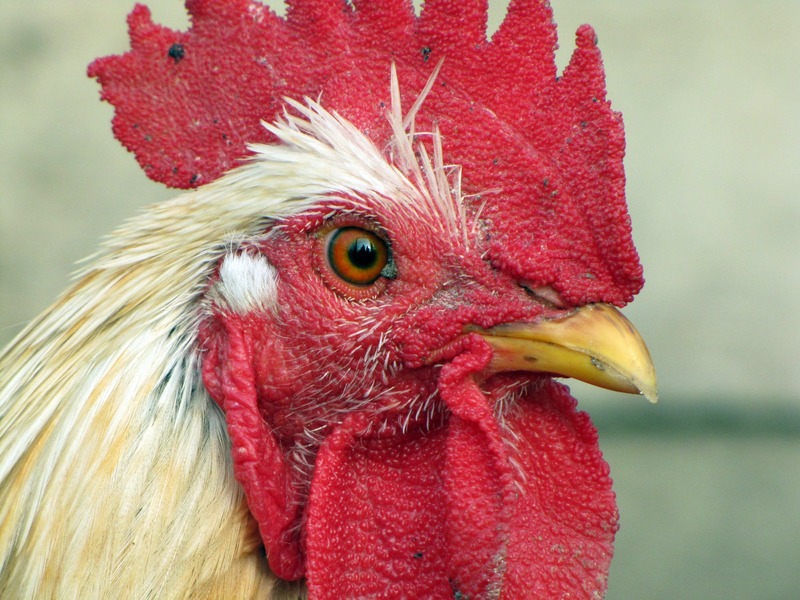 Are you considering adding a rooster to your flock of chickens? Read the pros and cons first! 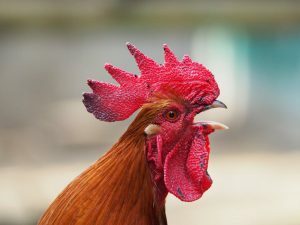 Here are 7 reasons why you should not have a rooster! Do You love your chickens as much as I love mine? I love looking out my window and seeing them run around my backyard eating bugs! I love watching mother hens care for their chicks! And I love to see my beautiful rooster sitting on a fence post crowing! You’re probably wondering why I just said I love to see my rooster! Isn’t this post supposed to be about why you should NOT have a rooster?! Let me first say, that I do indeed have a rooster! Yep. I have a rooster. Now, having a rooster is not for everyone or every situation. Roosters can be a serious problem depending on multiple factors! There are definitely things you need to consider to decide if owning a rooster is right for you. You know how cartoons portray roosters crowing at day break? Roosters do not just crow at day break. They crow All. Through. The. Night! Now, if your chicken coop isn’t close to your house, its fine. But if you have neighbors that are really close or if it’s really close to your bedroom, be prepared to hear a rooster crow in the night! 2. Roosters can be mean! Now, this doesn’t apply to all roosters. My rooster is actually a very nice rooster and has never tried to attack me or the kids. But I can remember as a kid being chased by a rooster that my parents had! It literally chased me into the shed and I had to jump up on a table to get away from it! And, when they attack you, they don’t just peck, they try to get you with their spurs! Which are like talons! So this is one reason that really just depends on the personality of your rooster. Certain breeds are known for being more aggressive as well. Our rooster is an Ameraucana rooster and he has never given us any problems. I can’t guarantee that all Ameraucana roosters will be nice though! If you have more than a couple roosters, then be prepared for war! 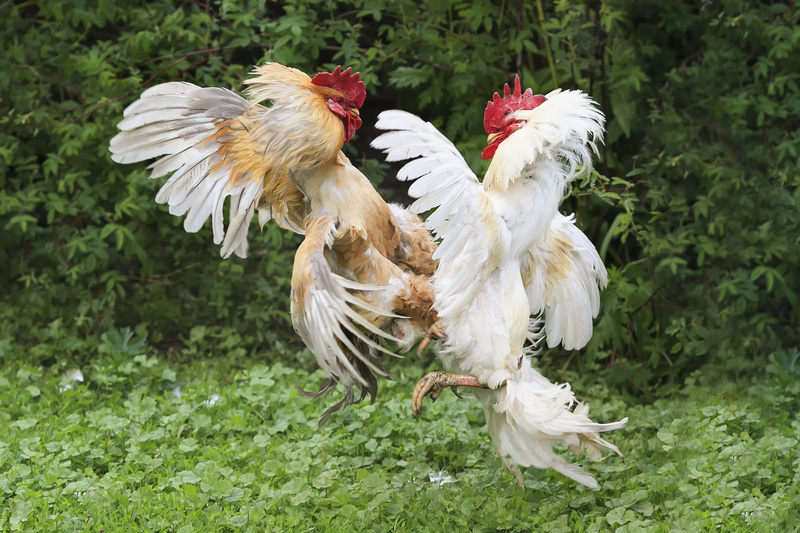 Roosters will literally fight to the death! We had baby chicks hatch out one year and almost all of them turned out to be roosters. So, we decided that when they were big enough we would butcher out the roosters so that we had meat in the freezer and plenty of bones for broth! Well, just before time to butcher, all the young roosters got into a fight! It was horrible! They were spurring one another, pecking one another, it was bad! So, you definitely do not want to have a lot of roosters. I have found that two at a time are not a major issue. They determine a ranking order and all is well. But any more than that, and it’s a major problem! 4. Roosters don’t lay eggs! This one might seem funny, but it’s a reason to not have a rooster! Roosters don’t provide any eggs. So if eggs are all that you desire from chickens, you really have no use for a rooster! You can find out here if chickens need a rooster to lay eggs! 5. 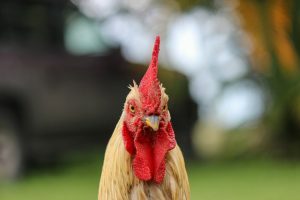 Your rooster might be illegal! In some areas you are not allowed to own roosters. Some developments have a no rooster rule due to the noise. Some areas only allow you to have a certain number of roosters. Check your local laws to determine if roosters are allowed in your neighborhood! This could definitely be a good reason that you shouldn’t have a rooster! 6. Roosters might kill baby chicks! Another reason to not have a rooster is to protect any new babies! If you introduce really young chickens, or a mother with young chicks into the flock then you run the risk of losing them to the rooster. Roosters will kill a chick to get it away from the mother if he wants to breed her. It sounds barbaric, but its true! Of course without the rooster there wouldn’t be chicks, unless you are introducing a hen that already has chicks to the flock. 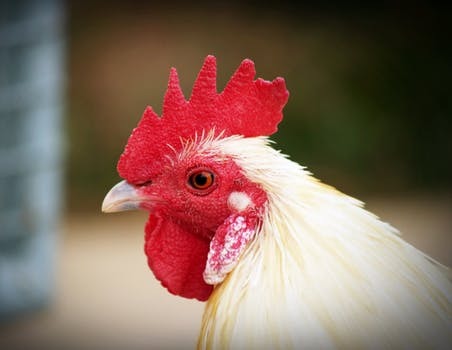 Read this post to find out more about when you actually do need a rooster. 7. Roosters can injure young hens! When a rooster mates with the hens, he can be very rough. If the hen is still pretty young a large rooster could seriously injure her when mating! I’ve had to chase a rooster away from a young hen before that was just too small for him! So this is definitely a good reason to not have a rooster! Now, I do want to say, that there are actually some pros to having a rooster! 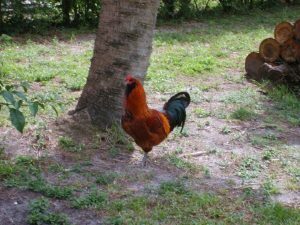 I know this list sounds kind of scary, but lots of people do have roosters! It’s really comes down to why you want to have chickens, and what works best for you and your family. Roosters are extremely beautiful birds! They are so colorful and elegant! Like I said above, I love to watch mine! Also, as I mentioned above, you can read here to find out when your hens actually need a rooster! And another pro is that roosters are very protective of their hens. So they are also good for protecting the hens from predators! 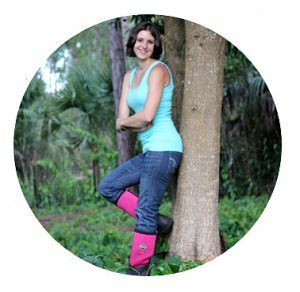 I hope this post has helped you in determining whether or not a rooster is right for you and your hens! Do you have chickens? Do you have a rooster? What is your experience with roosters? Leave me a comment below and let me know! Very good article! I have 6 roosters and only one of them is kind of a jerk. Otherwise the others are pretty friendly. But Russell Crow my big rooster likes to let me know that he is the alpha! As far as fighting goes, they pretty much stay away from each other. I love my current rooster. But I have had to send a couple to freezer camp for being too aggressive with my kids. My favorite breed for a rooster is Silkie. I’ve had two and they were never aggressive. And you are not lying about the crowing. I’ve gone outside at 1/2am and I can hear Henry crowing away…. I have a beautiful yet small rooster. Beautiful round tail feathers maroonish red with a hint of green & black. He sings beautiful & protects the hens unless it’s a darn bobcat. But he alarms everyone. Another thing I like about my rooster is his small size, he can’t reach to mate with the hens, but Lord he tries ? . That’s the good part. He is mean with some of my hens, yet tries to mate with them. He also attacks my Chihuahuas & sometimes humans including me. I had a couple of surprise hatches and ended up with 8 roosters. 5 went to freezer camp and I kept 3. Mine free range and I have a huge predator problem bald eagles, coyotes, owls so I want roosters to act as a guard/warning system. The oldest rooster chases the younger ones and he’s tried showing me who’s boss when my back is turned. I have had really good luck at turning the tables on that, a method I’ve used for every rooster I’ve had problems with, and now we have an understanding. 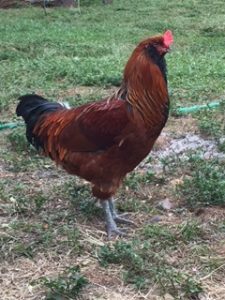 Hoss, my oldest rooster, is a huge blue laced red wyandotte with spurs about 2″ long. When he tries to attack (he runs up behind me and I basically get smacked with his wings) I corner him, catch him and carry him around under my arm for 20 minutes or so. Then gently put him down….I’ve had to do it twice this spring and he’s stopped (I’m sure he is on “high alert” because of the other roosters). Also, I have never had an issue with roosters crowing at night. Only my neighbor’s roosters but he kept a red light on in his coop 24/7 and he had predators in his coop at night quite often. Mine only get natural light and are locked up at night. The only way I will NOT have a rooster is if/when I can no longer free range and have to keep them in a run. Then I will probably just have layers and no roosters…. We have a mixed group. I hand-fed them when they were young which helped the roosters not be quite so intimidating 2 the hens as well as humans. However my first round at this we tried to eliminate the Roosters by giving them to someone who had an area for Roosters and we’re raising for me. As soon as we did we lost many hens to predators. I enjoyed having a mixed flock and will continue to do so just acclimate them young. I have 2 boosters and love them! They will find food and let the hens know it is there. We have lots of creditors they watch out for. Our alpha rooster even shows the chicks where food is and has never hurt one of them. My rooster don’t crow at night, only during the day. I love hearing my crows! I really lucked out with my rooster. He’s a big one with huge spurs who once actually attacked a fox who was going after his hens and ended up with a bent neck that took 2 painful months to heal but he’s always sweet to humans. His only downside is he will start crowing at 2:30 am and keep it up all day. But i love him anyway. I have a white leghorn he is very mean and he is the boss in the run and in the range. When I Give my hens treats he will usher them away from the treats and they don’t get to eat them. Sometimes I hear him crowing at night. We had, yes had a Crested Polish named Spot. He was very protective of my hens and very mean with anything else that crossed his path. He was hand raised and would perch on our shoulders when he was small but as he grew he became more and more aggressive. Finally he attacked my husband one too many times. RIP Spot. We had a beautiful rooster that was quite tame with humans but at some point started picking off my hens one by one. We lost two before we realised it was him and not some other animal killing them off. We had to lock him out of the coop at night and keep an eye on him through the day but he still managed to kill a third hen until a fox got him early one morning. Karma I guess. Much easier without a rooster. You got some good points there specially the fact that they are noisy and mean. I had four Red Rhode Island, however I discovered that after the second year they became even more aggressive with us. Now I only keep the roosters for one year and a half and no more than four at a time. I currently have 5 roosters, 3 are brothers, 1 is older, and 1 is a new guy I just brought in. I’d say the first couple of days while I was intro’ing Jager to the rest of the flock there was some light sparing, but no death happened.Now, mind you I have a mixed flock. I don’t just have any one breed. Jager is an IDK Frizzle & the 3 brothers are silkie crosses. Dingus & Jager were the only two I ever saw having a scrap. As for owning more then just 2, I’d say own as many as you’d like, you just have to know how to introduce them and also how your current roo’s temperment is. If he’ll get along with pretty much anything then you’re good to go, but if he has a snippy side to him, then best watch what comes into the yard. I had a Lav Orph roo a while ago who would attack everyone but me & my kids, he ended up being sent to a farm.